Victory! The Cuban 5 are finally free! After 16 unjust years of imprisonment, on 17 December 2014, Ramón Labañino, Gerardo Hernández and Antonio Guerrero, the three remaining members of the Cuban 5, returned to Cuba following their release from US gaols. This is a defeat for the corrupt US justice system and massive victory for Cuba, particularly for anti-terrorist Gerardo Hernandez who was serving two life sentences plus 15 years. The five Cuban heroes were arrested in 1998 and tried in Miami in 2001, in the midst of a hostile media storm whipped up by journalists in the pay of the US government. Denied a fair trial, they were found guilty of charges ranging from spying to conspiracy to commit murder and endangering the security of the United States. These men had been working to foil the persistent attempts by right-wing counter-revolutionary groups in the United States to commit acts of sabotage and terrorism against Socialist Cuba. These attacks included 78 bombings, 61 hijackings of planes and boats, biological attacks of dengue and swine fever, and 58 attacks from the sea, killing at least 3,478 people in total. The Cuban 5 were guilty of nothing more than peacefully trying to protect their country against terrorism. Their case Illustrates the hypocrisy of the US ‘War on Terror’. Wednesday 17 December will be recognised for decades to come as a crucial date for Cuban history when, following years of campaigning, the Cuban 5 were finally free. Ramon, Gerardo and Antonio now join Rene Gonzalez and Fernando Hernandez, who served their full sentences and were released in 2011 and 2014 respectively. Raul and US President Obama made simultaneous announcements, detailing 18 months of secret negotiations hosted by Canada and the Vatican, to review US-Cuban relations. In return for the three Cuban heroes, Raul announced the release of an unnamed US agent and the humanitarian release of US contractor Alan Gross, imprisoned in Cuba in 2009 on a $500,000 USAID mission to smuggle in secret communications equipment. In recent months investigations have revealed that Gross' covert programme was just one of several commissioned by USAID around 2009 and 2010 in the attempt to generate an internal opposition in Cuba. Other programmes included the setting up of a Cuban twitter service called Zunzuneo, efforts to recruit foreign students and attempts to infiltrate the Cuban hip-hop scene. After millions of dollars invested all of the programmes failed and were abandoned. The prisoner swap and release of Gross are the first step in renewing diplomatic relations between the US and Cuba, a move articulated by leading newspaper The New York Times. Obama has also announced that the US will re-establish an embassy in Havana and begin the process of removing Cuba from the list of ‘States that sponsor terrorism’. He also committed to attending April’s ‘Summit of the Americas’ alongside Raul Castro following Cuba’s 53 year exclusion from the Organisation of American States. Having campaigned against the unjust imprisonment of the 5 Cuban anti-terrorists since their imprisonment, the Revolutionary Communist Group and our campaign in solidarity with Cuba, ‘Rock Around the Blockade’, send our heartfelt congratulations and joy to the people of socialist Cuba who have withstood yet another attempt at undermining their long fight for national independence and anti-imperialist sovereignty. We will continue campaigning against the illegal US blockade and despicable Guantanamo Bay until these too are history. Cuban socialism, with its commitment to human development and internationalism is a beacon of hope for humanity. 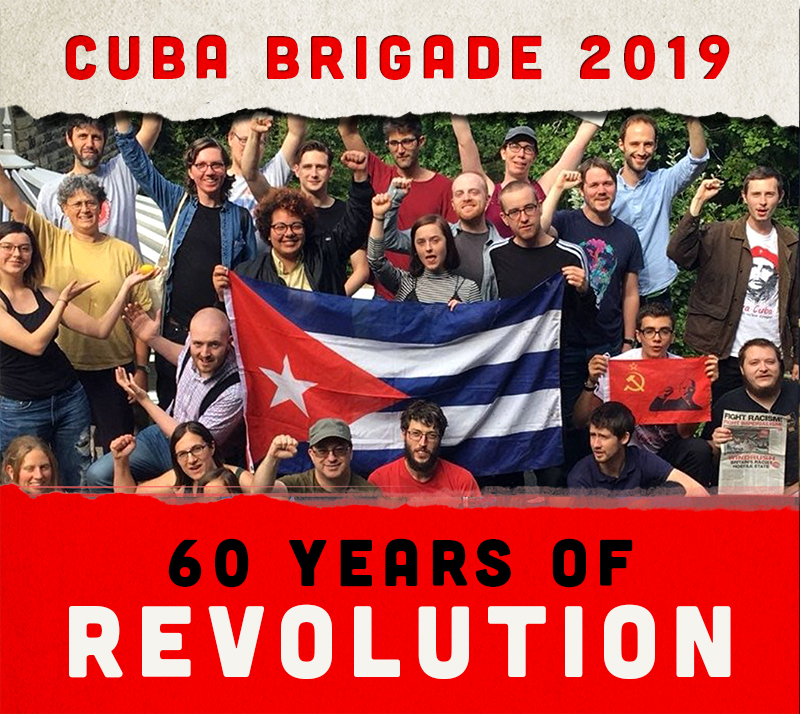 For more information on Socialist Cuba visit www.ratb.org.uk and support our 2015 Cuba Vive Brigade to Cuba.